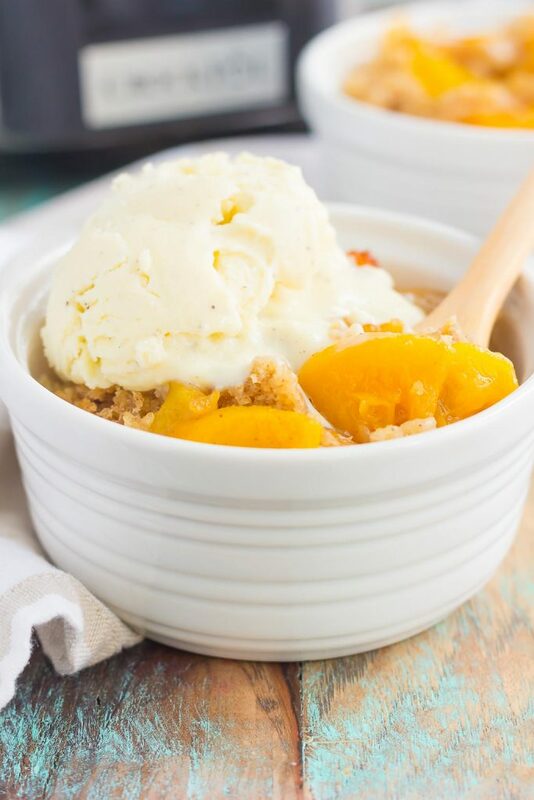 This Slow Cooker Peach Cobbler is loaded with juicy peaches, a sprinkling of cozy spices, and layered with a crispy, cakey topping. Just throw everything into the slow cooker, set it, and forget it. In just a few hours, you’ll have a warm and flavorful dessert ready to be devoured! 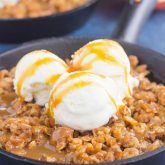 Cobblers, crisps, and skillet fruit desserts…oh my! Forgive me for my corny opening line, but I’m just can’t help myself when it comes to any kind of fruit cobbler or crisp. I’ve got a serious weakness for them, and I will take this fruit dish over a chocolate one any day of the week. Yes, you heard right. I’m all about the fruit! In fact, growing up, I would also request pie (specifically peach pie) for my birthday. None of that cake piled high with frosting! I was (am still am) obsessed with fruit desserts. Especially cobblers and crisps. Now, peach cobbler is one of my favorite desserts. I’d probably rank it as my second favorite dessert of all time (right after creme brulee). I love the sweetness of the peaches and the texture and flavor of the crispy topping. It just get me every time, especially when it’s warm from the oven (or in this case, slow cooker) with a big scoop of vanilla ice cream. Just thinking about this dessert has me feeling all warm and cozy. It’s like the perfect comfort dessert…am I right? Cobbler in a slow cooker….could it get any better? 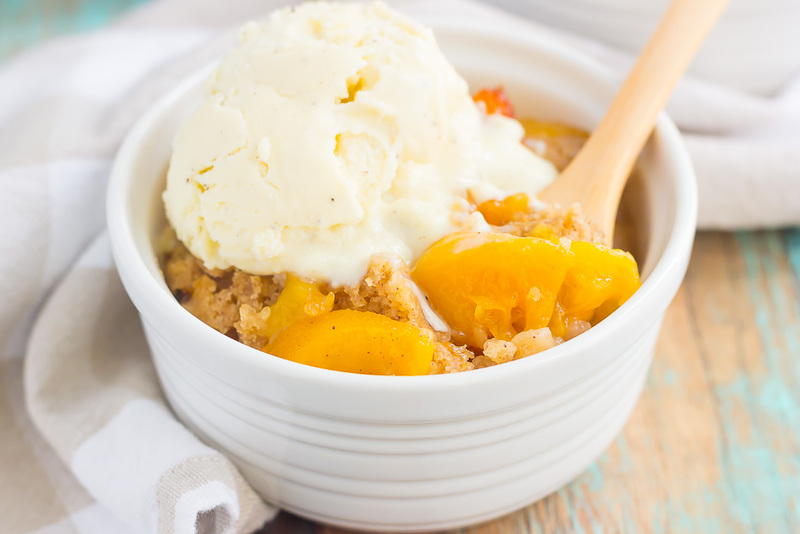 This Slow Cooker Peach Cobbler is everything. The juicy peaches, the sweetness from the brown sugar, and the warm hints of cinnamon and nutmeg. Plus, to cobbler topping is cakey, yet slightly crisp, and has just the right amount of flavor. Top this with a big scoop of vanilla ice cream, an this is what dreams are made of, friends! And I won’t judge if you have a bowl (or three) of this for breakfast. 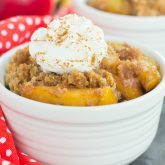 This Slow Cooker Peach Cobbler is delicious when warmed up, or can even be enjoyed at room temperature. And it’s easy to double or triple, depending on those hungry house guests. It also makes the most delicious dessert for the start of summer, too! So grab those ingredients, fire up your slow cooker, and whip up this easy and oh-so tasty dessert today! 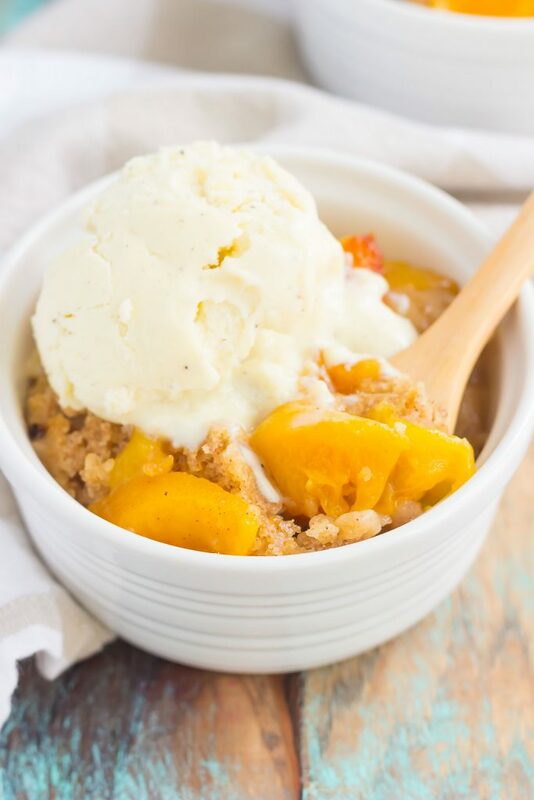 This Slow Cooker Peach Cobbler is loaded with juicy peaches, a sprinkling of cozy spices, and layered with a crispy, cakey topping. Just throw everything into the slow cooker, set it, and forget it. In just a few hours, you'll have a warm and flavorful dessert ready to be devoured! Spray a 6 quart slow cooker with cooking spray or line with a slow cooker liner. Set aside. In a medium bowl, combine the peaches, brown sugar, and cinnamon. Toss to coat. Spread peaches onto bottom of slow cooker. In another medium bowl, combine the Bisquick mix, brown sugar, white sugar, cinnamon, nutmeg, vanilla, and milk. Stir thoroughly to remove lumps. Spread mixture evenly over peaches. Like the edges of the top of the slow cooker with paper towels so that condensation doesn't leak into the cobbler, cover and cook on low for 3-4 hours, or until center is set. This is the perfect summer dessert -- especially because I don't have to heat up my oven to bake it! The flavors and texture look amazing...I bet it wouldn't last long in our house! 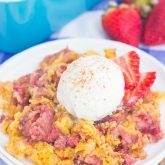 Slow cookers are the best for summer desserts! Thanks, Blair! I've never made a cobbler in my slow cooker before, but totally have to try this one! I bet it smells amazing and so perfect when there's people over! I'm with you - I don't like anything too sweet and this sounds like a delicious dessert, but something that you don't feel so bad after eating it, ya know. After all, there's fruit in there ;) Pinning! Happy Monday, Gayle! Desserts in the slow cooker are the best, especially cobbler! Thanks, Dawn! Oh! Wow this pictures are watering my Mouht.. Would definitely try this as soon as possible. Thank you for sharing this great information. Thanks for the kind words and for stopping by, Supriya! 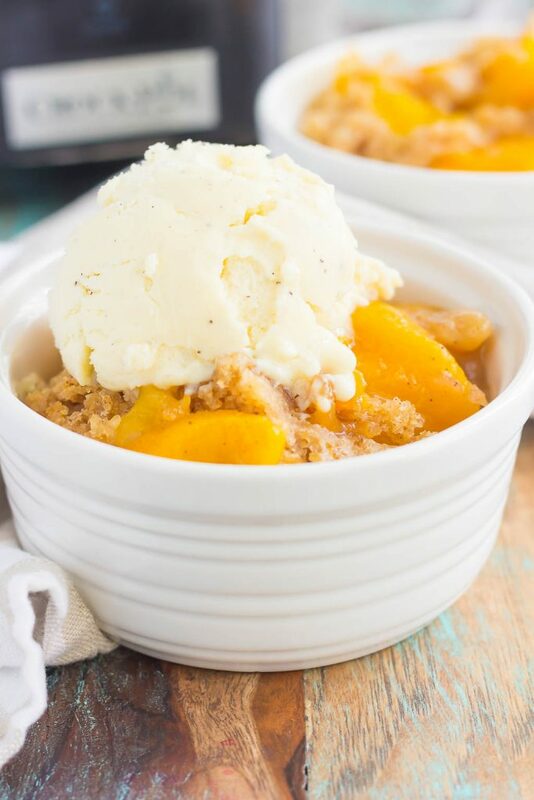 Peach cobbler is mine and my boyfriend's FAVORITE dessert in the summertime and I can hardly wait to make this crockpot version for him! Looks SOO good with that scoop of ice cream on top! Isn't it the best?! Thanks, Sarah! Haha I could totally do that, too! :) Thanks for the sweet comment, friend! I'm totally with you -- the streusel gets me every time! I'd definitely take it over all that overly sweet frosting for a birthday! This looks so good -- I think it'll absolutely be happening soon! Streusel definitely wins over frosting! :) Thanks, Ashley! 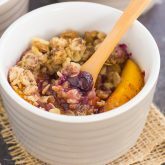 I have a serious weakness for all fruit desserts too and a slow cooker crisp is on my radar to try. I love the sound of this cobbler and it's been ages since I made one. I can't wait to try it! Fruity desserts are my favorite too especially during the spring and summer! 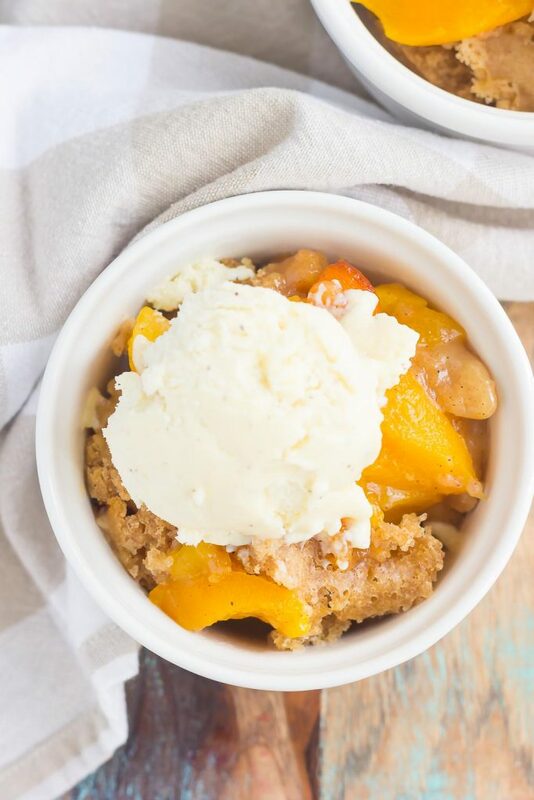 Love that you made this yummy cobbler in the slow cooker! It looks perfect with a scoop of ice cream! Thanks, Kelly! The ice cream makes this extra delicious! I can't believe you made cobbler in a slow cooker! I used my slow cooker this weekend and it's still out so this is happening!! Thanks for sharing such a fun and tasty dessert! This is a keeper! Thanks, Annie! It's so fun to make in the slow cooker! I LOVE anything slow cooker and can never seem to remember that you can do sweet things in there too! Awesome idea Gayle! Peach desserts are the best! Thanks, Manali! I'm a big fan of fruit desserts, too! I bet this peach cobbler just makes the house smell amazing, Gayle! Perfect summer dessert. Can you make this with canned peaches? Hi Jill! Yes, canned peaches would work well. Hope you enjoy this if you try it! Any way to make the topping thinner or is it suppose to be thick? Hi Whitney! The topping is supposed to be thick, but you could make less and it would be thinner. I haven't tried that though. Hope you enjoy and thanks for stopping by!